Heidelberg view of the marketplatz and the Church of the Holy Spirit. Copyright 2012 Robin L. Chandler. Situated on the northern side of the river Neckar, the Philosophenweg or Philospher’s Walk, provides beautiful views of the picturesque city of Heidelberg, Germany. After a good hike from the train station, I found myself gazing down upon the ruins of the schloss, the old bridge, the medieval marketplatz and the imposing late Gothic Church of the Holy Spirit. 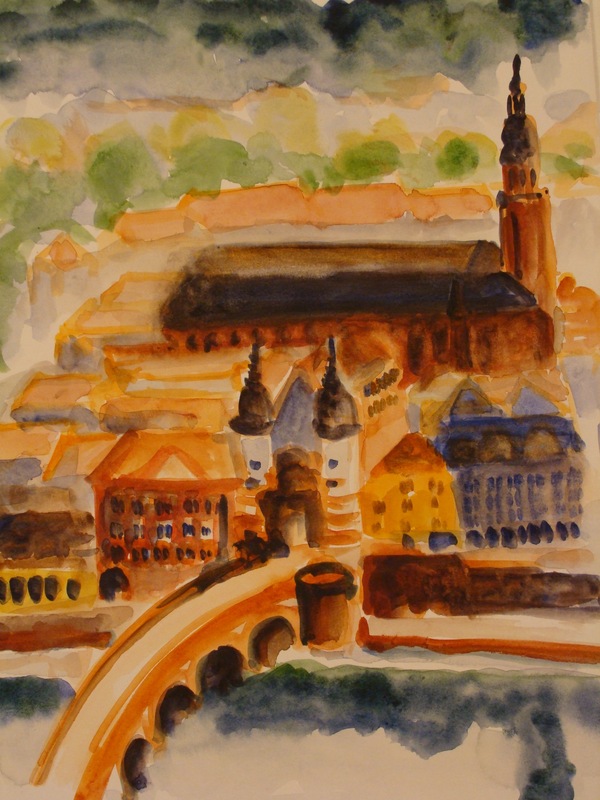 My friend Astrid had encouraged me to visit Heidelberg, and soaking up the southern exposure tucked amongst the vineyards and vegetable gardens dotting the hillside and the industrious bees, I was glad I took her advice. Below me the sounds of a bustling city travelled across the river and up the hillside. Sited on a major tributary to the Rhine Heidelberg has become a tourist destination – whose history spans the Romans, the Reformation and the third Reich – it is also the site of a major University making significant contributions in scientific research. Being September, the faculty and students – like migratory birds – were winging their way back to begin anew the cyclical learning experience. In such a place, history is everywhere – you sense the very vineyards surrounding you have roots in the pax Romana. Reaching for my watercolors, I began sketching, attempting to capture the moment before returning to the bahnhof and Frankfurt. Although painting requires focus, it also provides a quiet time for reflection and anticipation. Thirty years have passed since my first trip to Germany. In 1982, my youth, love of history, and study of Existentialism brought me to Cold-War Berlin, Hitler’s Munich, and the Nazi concentration camp at Dachau seeking answers to difficult questions. Germans have a phrase – Vergangenheitsbewaltigung or Aufarbeitung der Geschichte which means the working through of history. Returning in 2012, this trip is a continuation of a conversation started. History is a heavy responsibility. It can be crippling or it can be a reservoir of evidence preserved by archivists supporting scholars, who sift through the past seeking patterns, providing perspectives, guiding us in the present. Ahead still lay my journey from Bingen to Bauhaus (tempted to sing out the lyrics to the tune of Emmylou’s Boulder to Birmingham, I delayed the impulse). On this journey we would visit Bingen on the Rhine near Niederwalddenkmal the monument commemorating Bismark’s 1871 Prussian victory and the beginning of the German Empire, the former ghettos and cemeteries of Jewish Frankfurt, Zollverein the coal-mining complex of the Ruhr Valley, the gardens of Sanssouci, the Einstein Tower an Expressionist masterpiece by Erich Mendelsohn, the 1936 Olympic Stadium site of Jesse Owen’s triumph, Bertohlt Brecht’s Archives & Museum in former East Berlin, and Walter Groupius’ Bauhaus in Dessau. For the trip, I brought with me Stephen Ozment’s A Mighty Fortress: A New History of the German People. Ozment puts forward what he calls the Tacitus challenge: can a more than 2,000 year old civilization be defined by its last 150 years? Paraphrasing German Historian Thomas Nipperdey, Ozment writes it is one thing to know the end of a story and to be moved by it to learn the whole story, and quite another to tell that story from its known outcome. Because of this visit, my personal tapestry of European history is more complete. Over the years, I have made many journeys to France, Great Britain, and Italy and solo excursions to Austria, Czech Republic, Hungary, Norway and Slovakia. Because of this visit, the weak threads connecting Germany with her neighbors are strengthened to more fully support my understanding of the warp and weft of European history. Working through history is good advice — grapple with the past – but engage fully and openly in dialogue with the present.